The view coming out of Big Bear. This morning we said our official goodbye to the Big Bear cabin. Lisa's mom and brother came in late last night so we got to meet them when we got up. We ate leftover Thai for breakfast and packed on up. I think we were all so ready to be back on trail. I've missed seeing cloudy skies. Matt took us to hwy 18 and we said goodbye to him. The weather was much better today, it was a mixture of clouds, sun and rain clouds. We started hiking and after the first five minutes, we had lost Lisa and her family. I think they had stopped to adjust some things for her mom but we never saw them again! They had to go at a more chill pace since she had her mom with them. Kristen, GB and I hiked on. Sometimes we lost track of each other but I waited for them at our first water source. I sat for quite awhile and ate a lunch. 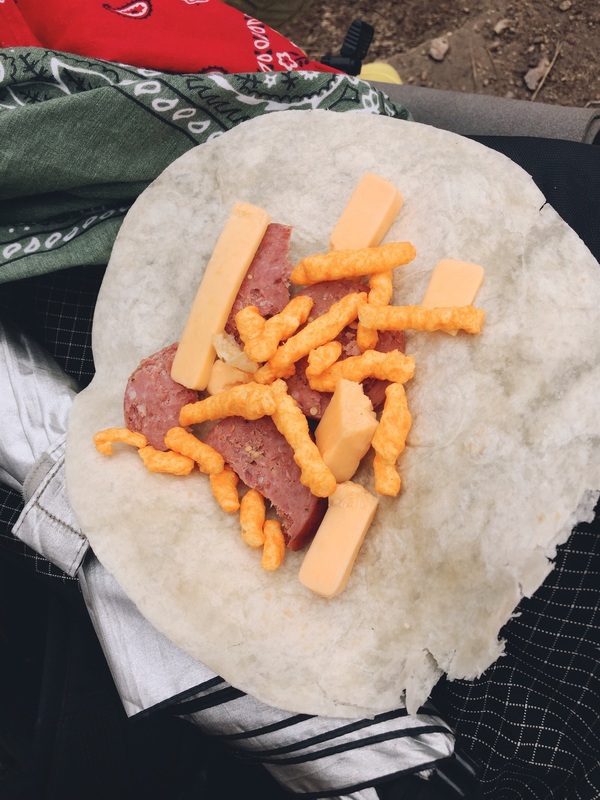 My very first hiker trash meal: cheese, summer sausage and Cheetos wrapped in a tortilla. We collected some water and decided to leave Lisa and Rusty a note, telling them that we were sorry we didn't get to say bye to her family but to have a great hike! From there, I solo hiked the rest of the way. There were a ton of parts where so many trees were burned and down. I wanted to do 17-18 miles today. Surprisingly, I felt super good today. Maybe the new shoes really made a huge difference because my feet weren't hurting so bad until the teens. I wanted to find a site at around 294 but I was stuck on a ridge and it started raining for the last five or so miles. It wasn't super hard but I put my poncho on early and was able to keep most things dry. While I was walking down I thought, "Wait, where are my tent stakes?!" I just realized I hadn't seen them at all in the cabin. I started to worry and prayed that they were somewhere in my pack. If not, I would be prepared to just sleep with my tent collapsed on me. I wasn't looking forward to it since it was rainy. I would've also tried to pitch with some sticks and rocks but it'd be pretty janky. Walking through the burned section in the rain, it felt so desolate. I finally reached little bear campsite at 295 and took out my tent to lay on the ground. I took everything else out of my pack and no stakes. Then I pulled out my trash bag and on the bottom of it were my stakes! I have never been so happy in my life. I set up as fast as I could in the rain and jumped in. I ate couscous and wrapped it in tortilla for dinner. It soaked pretty well so that's good to know, I also added some spinach powder. I am a little chilly right now inside my tent. I really need to pee but I lost my croc and don't want to wear my soaked tennies. I'm ready for some sun again.